It’s not only Punjab, but Himachal too is getting affected with problem of runaway NRI grooms leaving behind their brides to fend for themselves. But the issue of abandoned brides seems to be lost amidst myriads of large issues confronting women with Police not submitting ATRs (Action Taken Reports) in such cases. The fact came to light during the 2nd day of public hearing by National Women Commission member Rekha Sharma at Shimla. Talking to The Statesman, Rekha Sharma said three cases of abandoned brides have came to light today in which NRI grooms from countries like Qatar, Australia and Germany never returning or leaving women with their parents. ?So far we have received around 6-7 such complaints from women and some cases even dates back to 2003,? she said. There was a case in which a woman was left to fend herself with a disabled daughter with any support in-laws with the groom refusing to accept the relation. In another case, a NRI from Germany married a girl from the state but he later refused to accept the marriage. Later he married another woman he loves and fled from the country. The woman is now being coerced by her in-law for settlement and are reportedly offering Rs 40 lakh. Sharma also raised questions on lack of followup by police officials in such cases and added ?I would write a letter to Director General Police, HP to direct police officials to strict and prompt action in such cases.? Sources said the cases of women being subjected to cruelty of false marriage, cheating and dowry extortion have increased in proportion to the growing number of Indians emigrating in search of green pastures abroad. ?Unfortunately, it is the rural and middle class people that often succumb to the temptation of acquiring foreign groom. It is only when the daughters are abandoned that the parents, who have possibly liquidated their assets to help their daughter enter into the so-called marriage wake up and approach the state authorities,? sources said. The women rights group are now calling on the government needs to address the problem by considering suggestions such as marking on the visa marriage status of the person; providing legal assistance and financial aid to abandoned women, liaison with foreign governments to book the grooms in bigamy charge and to restrain the grant of ex-parte divorce by foreign courts. In two days public hearing, the NCW has received 90 complaints, out of which 38 were received today. Good news for commuters using the Dehlon-Nangal-Lehra link road, as an unsafe bridge constructed on the drain, which was earlier a death trap for commuters, was widened by an NRI family settled in the United States. The situation used to worsen for commuters during fog due to poor visibility. The diversion of traffic on the link road following the establishment of Lehra Toll Plaza on the Ludhiana Malerkotla road made the repair or reconstruction of the drain bridge necessary. Area residents, including Ranjit Singh and Harjit Singh, said NRIs ? Kunda Singh Virk and Kiran Jit Kaur Virk ? came forward to widen the unsafe and unguarded drain bridge by constructing a new portion along the old one. The gesture is expected to prevent a number of accidents which could have been caused due to fog. The bridge was thrown open for traffic by Sant Baba Resham Singh Chakk Pakhian Wale during a simple function organised here today. 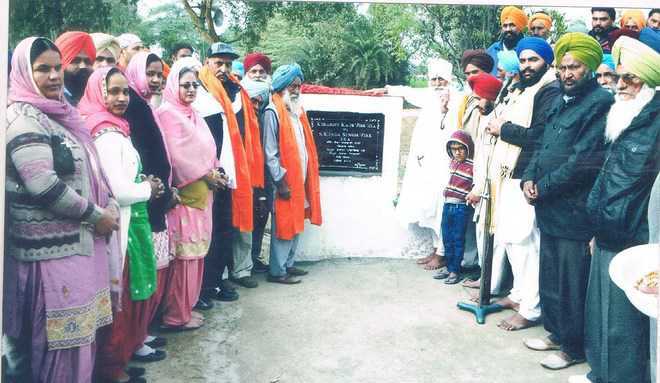 Kunda Singh Virk and Kiran Jit Kaur Virk were felicitated on the occasion. Can I ask a prospective employer to file a H1B as a part of a negotiation? Sure you can. If the employer finds your skill and experience valuable, marketable, they will agree. However, keep in mind there is no grantee that an H1B application by your *new* employer will eventually be approved by USCIS or the Visa Officers. Can a NRI deposit 2.5 lakhs without a PAN card? I am assuming the question is for deposit into NRO account (where one can deposit Indian currency). Deposit of Rupees saved/earned in India is not permitted in NRE account. My passport is expired but oci is valid can I still stay in India? You should be able to continue to stay in India if you entered the country with a valid Passport and OCI. However, keep in mind you will need to renew your (foreign) Passport before any travel out of India. The Indian government unabashedly woos the Indian diaspora to invest in various sectors in India and is considering easing norms further. Yet, the government makes Non-Resident Indians (NRIs) jump through hoops when it comes to investment in real estate. Finally, there is some hope. RR Singh, director general, National Real Estate Development Council (NAREDCO), says the industry body has presented a set of recommendations to the government, requesting it to ease regulations in the real estate market. While, at present, NRIs can invest only in real estate, Naredco is pushing for them to be allowed into land developments and large-scale commercial properties as well. Such a relaxation would help generate liquidity in the real estate market, which is witnessing a slump and delayed delivery on account of subdued consumer sentiment, high debt and slow growth. There is already a high level of inventory piled up, Singh points out. The figures from the Dubai Land Department (DLD) show that Indians top the list of non-GCC (Gulf Cooperation Council) investors in Dubai real estate. Outside the Arab world, Indian nationals contributed the lion?s share of investments AED7 billion ($1.9 billion) from 3,656 transactions, according to the DLD. This makes them the biggest investors in Dubai real estate during the first half of 2016. In the US realty market, Indians are the third-largest international investor community, at US$8 bn, after Canadians and Chinese, according to brokerage firm Sotheby?s International Realty. Other corridors such as the UK, Vietnam, Singapore and Australia, which have relaxed investments from foreigners, have also seen a rise in Indian investors buying properties. What are some of the restrictions? (c) ?Where the foreign nationals have inherited property from a person who was resident in India. (a) ?Acquired by way of inheritance and with specific approval from RBI; or (b) Was purchased with specific approval from RBI ? 5 Citizens of Pakistan, Bangladesh, Sri Lanka, Afghanistan, China, Iran, Nepal, Bhutan, Macau or Hong Kong (?Restricted Countries?) are not allowed to acquire or transfer immovable property in India without prior permission of the RBI, except when they lease an immovable property for a period not exceeding five years. Indian developers have started realising the investment potential of NRIs and are actively showcasing their property portfolios at exhibitions abroad and simultaneously demanding a relaxation in policies. Experts believe that certain flexibility in relation to acquisition and transfer of immovable property by NRIs is required. Provide renewable leases: It has been recommended that foreign investments through acquisition of immovable property should generally be allowed and should only be subject to land title agreement and renewable ownership leases. Acquisition of land development/plotted development: A number of developers have come up with villa properties. ?Regulations should provide approval for plotted developments and properties such as bungalows, semi-detached and terrace houses,? says a Delhi-based developer and member of the Confederation of Real Estate Developers? Association of India (CREDAI), requesting anonymity. Measure to check price speculation: He suggests that to check price speculation, there should be a check on stamp duty payment. The differential treatment to ?citizens of restricted countries? from the perspective of acquisition of immovable property should be relaxed to the maximum extent possible. If required, these can be periodically re-evaluated and amendments made. The restrictions noted above have adversely impacted foreign investments in India while countries like the UAE, Singapore and Mauritius have increased their inflow of investment by liberalising the restrictions applicable to immovable properties. A relaxation in policies will not only stop speculation in the Indian property market but also infuse much-needed liquidity in the market. Current market conditions for NRIs NRIs prefer other countries over India to invest in real estate. Developers ask Indian government to ease restrictions on NRI investment in India. Industry body submits recommendations to central government. Permission to allow NRI investment in land developments and commercial properties sought. Bank in Kodaikanal refuses NRI?s deposit on ?security concern? Madurai: In a shocking incident, the branch manager of a nationalised bank in Kodaikanal gave a written statement to a Non-Resident Indian (NRI) that he could not accept a cash deposit of Rs. 1.5 lakh owing to ?security concerns?. Impact of Indian Government?s decision to demonitize 500 and 100 Rupee notes? What should the Indians abroad in possession of ?500 and ?1000 notes do if they are not returning till 31 Mar 2017? The NRI, Albert Fernando, has an account with the bank in Tallakulam branch in Madurai. ?I have been doing construction work in Kodaikanal with the money I withdrew from Tallakulam branch in Madurai. However, Rs. 1.5 lakh remained with me when demonetisation of Rs. 500 and Rs. 1,000 notes was announced,? Mr. Albert said. In an unexpected development, his friend in Chennai fell sick and he had to rush there to attend to him. However, since the money in hand was in the denomination of Rs. 1,000 and Rs. 500, he wanted to deposit it in Vadakaunchi branch of the bank in Kodaikanal. When he handed over the pay-in slip along with the cash on November 16, the cashier asked Mr. Albert to meet the Manager. The Manager told him that he could not repay the huge money in smaller denominations immediately, though Mr. Albert clarified that he only wanted to deposit the money. ?I had to travel a lot and did not have time to go back to Madurai to deposit it at Tallakulam branch. I also had apprehension about its safety in carrying it along with me,? he said. ?The bank officials asked for my PAN card which I produced. After a brief chat with the cashier, the Manager said that there was a burglary in the branch a few months back and refused to take the money citing safety concern,? Mr. Albert said. However, when Mr. Albert insisted on a proper reply, the Manager gave that in writing on the pay-in slip. Mr. Fernando said that the Manager was only shirking the responsibility of accepting the remittance of Rs. 1.5 lakh, when the Union Government had allowed deposits up to Rs. 2.5 lakh account holders? accounts. ?If the bank had such a serious compromise on its safety, how are other deposits kept in the branch?? he asked. He lodged a complaint with the bank officials in Madurai. Author garamchaicomPosted on December 15, 2016 Categories UncategorizedLeave a comment on Bank in Kodaikanal refuses NRI?s deposit on ?security concern? A Good Samaritan in the city has got an NRI tycoon Deepak Kant Vyas, founder of Redberri Global Corp., St. Louis, to adopt a village near Bibinagar in Yadadri district. When the Samaritan noticed that someone was grabbing a 24-acre land belonging to Mr Vyas, he Googled the tycoon and mailed him an alert. The gang had created fake documents and was trying to dispose of the land. Mr Vyas, who had never returned to his native village in Bibinagar, met minister K.T. Rama Rao when he was in Chicago, and complained to him. On the minister?s directions, revenue and Cyberabad police officials arrested 10 members of the gang. Mr Vyas offered a reward to the Samaritan but he refused the money and asked him to provide health and education facilities by adopting the village. In October, Mr Vyas met Mr Rama Rao in Chicago and submitted a memorandum. Following this, the minister directed revenue and police department to launch a search operation in Bibinagar. Special teams were formed by Rachakonda Commissionerate. Police commissioner Mahesh M. Bhagwath said, ?The plan was to encroach on the land to the extent of 24 acres, it involved forgery, fabrication of revenue records, creation of fake Aadhaar card by nearly 21 persons in Survey No. 567,569,583 of Raghavapuram (v) Bibinagar (m) Yadadri district.? He said Mr Vyas had not seen the land for 15 years. ?Noticing this situation, one Korni Mahesh, a real estate businessman, and 20 others created fake documents, passbooks, and even rubber stamps with the designation of the mandal revenue officer and the revenue divisional officer,? Mr Bhagwath said. ?The role of the sub-registrar will be ascertained after a thorough verification of the records. The police on December 15 arrested 15 members of the gang and six are absconding,? he said. After the operation ended, Mr Vyas thanked the city resident and offered to help him. The Samaritan turned the offer down and instead urged him to adopt Bibinagar to strengthen its health and educational facilities. The NRI is in talks about the adoption. Minister K.T. Rama Rao said, ?Public is requested to go for registration of any particular piece of land or plot or a house with proper documents containing link documents, government fee receipts, encumbrance certificate and the original certificate of the revenue department. Without proper link documents public should not go for registration of any property.? SINGAPORE: NRIs have an advantage in luxury property market in India post-demonetisation as real estate developers in major cities of the country have “significantly” dropped property rates, according to Singapore-based business analysts. “Given the recent demonetisation move, property rates have significantly dropped across various cities in India,” said Abhijit Ghosh, India Desk leader at PricewaterhouseCoopers (PwC) Singapore, an international financial consultancy. There has always been a trend for NRIs to invest in Indian luxury condominium apartments in the metropolitan cities of India, particularly such as Mumbai, Delhi, Bangalore and Chennai. Industry observers said Chennai-based developers are cutting prices by up to Rs 20 lakhs on slow-moving projects. “Experts believe that we can soon expect a 10 per cent-25 per cent discount in the luxury segment of residential condominiums and also in the upmarket areas such as Nungambakkam, RA Puram and MRC Nagar in Chennai,” Ghosh said. They have also forecasted Delhi property prices to offer 25 per cent to 30 per cent discounts and Bangalore to offer 30 per cent to 40 per cent discounts. NRI sources expects luxury property prices to drop by 25 per cent to 30 per cent. Property transactions have plunged significantly in the last month post announcement of the demonetisation programme on November 8. Bangalore property registrations have dropped to about 200 per day, compared to approximately 1,800 properties before demonetisation took effect, the experts said. Mumbai is expected to see a 50 per cent to 70 per cent slow down or may even go to a no transaction period. India’s property enquiry portals, as observed by experts, have seen a significant dip, about 400 people per day asking from erstwhile number of 1500-1,700. But it seems that the overall market sentiment at this juncture is to wait and watch and make the right move at the right time, they said. There is no denying that the NRI community will be taking advantage of the situation and explore to invest in luxury condominium residential apartments in India, Ghosh said.